A few years ago, one of the Young Men leaders in our ward mentioned that they were going to order a set of 2 perpetual plaques to display in the foyer of our ward building. One would be for Duty to God and the other would be for Eagle Scouts. We loved the idea and went ahead with ordering a plaque for the Young Women also- a plaque recognizing those who complete the Personal Progress program (i.e., earn the Young Women Recognition Award). Of course I’ve seen plenty of other wards with these sort of plaques- some with multiple plaques dating back to the 90’s (or maybe even earlier!). Many wards also have plaques for other things (such as a list of those who have served full-time missions) and may also display plaques for those currently away on missions. For some reason, we didn’t have any plaques in our foyer at all. It had been a while since anyone had earned their Eagle Scout or completed Personal Progress, so I’m not sure if order plaques were taken down at some point because they were so outdated or if we never had plaques in the first place. Or maybe we had plaques they stayed with the other half of our ward when the ward split, many years ago? 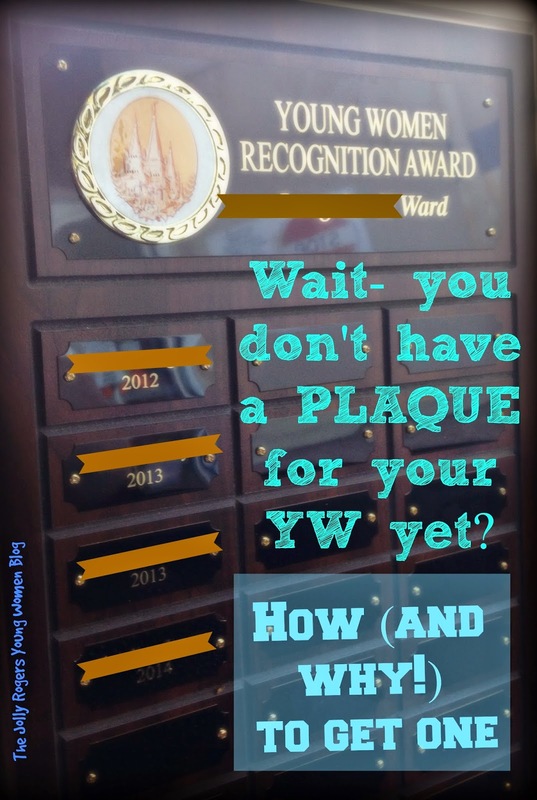 Regardless of the reason for our lack of plaques in the recent past, we wanted a plaque for the YW for the same reason that the YM leaders wanted the plaques for the YM…to make completing these goals a prominently recognized and celebrated event. It gives the other youth something to look forward to and work for. They see it on Sunday mornings and Wednesday nights. It reminds them of what they can accomplish and gives them good examples to follow. How do you keep the lettering/look uniform? We ordered all 3 plaques for our ward from the same company. I think that its important to have a clean look, so having matching plaques (or at least coordinating them as closely as possible, if you already have some plaques on display). There are a wide variety of styles available, but a consistent look is generally more professional. Check with your Bishop to see where you can place your plaques (I’ve seen them in foyers and other hallway areas). In addition to having a plaque that coordinates with other plaques that are on display, you’ll want to keep the lettering consistent as well. It would look a little strange to have the YW plaque with names in a blocky all-caps text next to an Eagle Scout plaque with cursive text. Even worse would be to have multiple text styles/sizes used for names on the very same plaque. Some styles of plaques require you to order separate name plates that are later ordered and engraved as-needed, then sent to you to attach to the plaque. We ordered a plaque with all of the blank name plates already attached. Instead of trying to remove the name plates when we need to add names, I just take the whole plaque with me to an engraving shop. I use the same local shop for engraving every time, to try to get a consistent look. They’ve kept a record on file of the text type/size they use for the plaque so that they can duplicate it easily when a new name is added. Some adjustment has to be made for very short or long names, but in general they look pretty uniform. Having a name and year engraved onto a name plate costs about $6 in my area. In case I’m released (or the YM Presidency needs to add a name to one of their plaques), I’ve taped a business card of the engravers shop on the back of each plaque, along with a little note with instructions (what name the text information is filed under, etc). Why no mention of “Personal Progress”?Although the program is called Personal Progress, the actual name of the award is the Young Womanhood Recognition Award. Thats what the certificate they receive says. 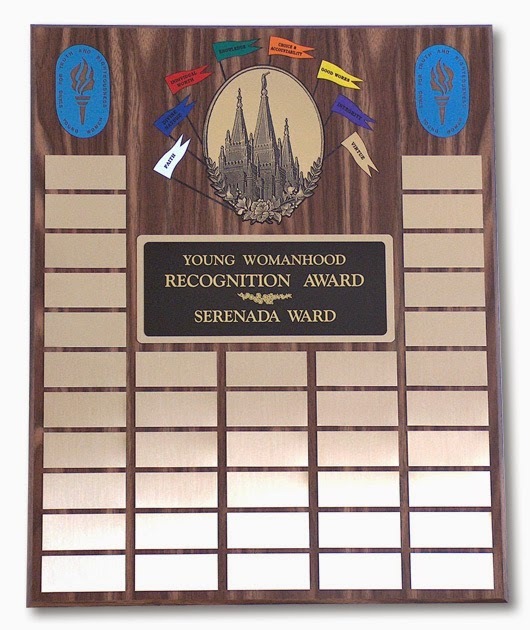 You’ll notice that all of the examples of plaques above use the phrase “Young Womanhood Recognition Award” instead of “Personal Progress”. Its just more fancy-sounding, I guess! 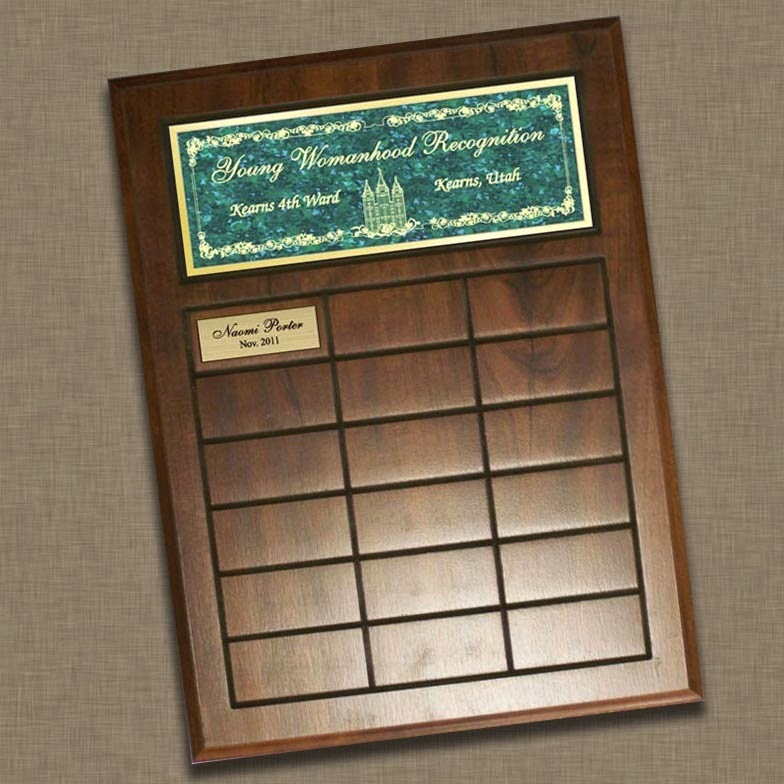 What about YW leaders – do their names belong on the plaque? I’ve seen some wards include the names of YW leaders on their plaques that recognize completing Personal Progress. While I would never want to diminish the accomplishment of anyone who completes the program, I opted not to include adult YW leaders on our plaque. When we received the plaque, my daughter was almost finished with Personal Progress and I was very close to completing the program as well. Believe me, I would have loved to put my own name on there, too (I know very well how much work it is to finish!) but I felt like it might take away from honoring the YW (especially my daughter) in some way. I felt like it was something special just for them, and that putting myself on there so close to my daughter might feel like self-promoting and could distract from her accomplishment in some small way. That was my personal choice, but there isn’t anything necessarily wrong with honoring YW leaders in this way. Like I said, I’ve seen lots of wards do it. How far back do you go with the names? To be honest, there has been a little grumbling about who’s name was (or more specifically who’s name wasn’t) put on our new plaque. 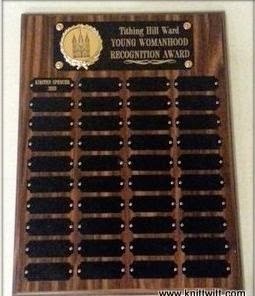 Since nobody could remember when (or if) we’d ever had a plaque for the Young Womanhood Recognition (or anything else! ), I knew that there were undoubtably at least a few girls who had completed the program in past years who never had their name on a plaque. We don’t have a large number of youth in our ward, so we’re not talking about a lot of girls… I only know of a few people who finished the program sometime between 2006-2011. The last girl in our ward to have completed the program graduated the year before we ordered the plaque and had long ago moved out of the ward. I felt like it would be best to start with girls currently in the YW program. However, if we’d had someone who had finished the program the same year we ordered the plaque, I would have considered that (especially if they were still in our ward). One person complained that their daughter’s name should have been listed, because she had completed Personal Progress. The daughter they were referring to was another example of a YW who had completed program years ago and is now a married adult (and no longer in our ward). My purpose was not to exclude people, but I did have to be realistic. It would be impossible for me to accurately track down everyone who had ever been a YW in our ward in the past 20 years to ask if they completed Personal Progress and try to verify the date of completion. To be fair, if I were going to list any previous recipients, I would have to list them all. An impossible task. So, “current YW only” it is! Is a plaque really THAT big of a deal? Whether you have a plaque or not, please make a big deal out of Personal Progress. It IS a big deal. I have many posts about how to get your YW excited and interested in Personal Progress, so please check them out (see the Personal Progress category at the top of the page). Since we ordered out plaque, we’ve had 5 Young Women and 2 YW Leaders complete the Personal Progress program. Thats an average of 3-4 people completing the program a year. That is an astounding number compared to what has been done in the previous years! A plaque by itself won’t make a big difference, but an overall effort and emphasis on Personal Progress definitely does!! !